Today, businesses are expanding round the world, and the companies have already set foot in global markets. Globalization has led the companies to expand their role towards society, along with inflating the profits. Certainly, these are responsible for bringing an immense amount of change in the society. Companies nowadays understand their responsibility towards the society, and make more positive and influential changes. As defined by the World Business Council "Corporate social responsibility is the continuing commitment by business to behave ethically and contribute to economic development while improving the quality of life of the workforce and their families as well as of the local community and society at large". Federation of Indian Chambers of Commerce and Industry (FICCI) promotes social responsibility via awards, trainings, projects and various technical assistances to small and medium enterprise. 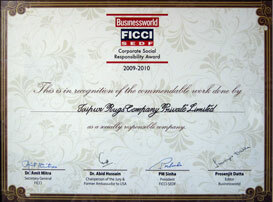 Jaipur Rugs efforts got appreciated by FICCI on 3rd May’10 for following the best corporate social responsibility practices. The company received the Certificate of Appreciation, “Business world FICCI -SEDF Corporate Social Responsibility Award-2009", from Mr. Anand Sharma, Union Minister for Commerce and Industry. The company went through a whole scrutinized process, incorporating Grant Thornton (international accountant and business advisor). Jaipur Rugs Company is in a constant process of generating more employment opportunities, where it has reached to upgrade the lives of 40,000 artisans residing in different villages across the country.